OMAS, sadly, went into voluntary liquidation in January 2016. (Fortunately, Emmanuel Caltagirone bought the defunct OMAS assets and created Armando Simoni Club which uses the same Arco Celluloid that OMAS is famous for). I lay-byed this newer model OMAS Paragon shortly after the end of OMAS from a local shop in my home town. Late that year it was finally mine. I've had this pen until recently when I traded it for another OMAS that I, personally, find more comfortable. The OMAS Paragon Arte Italiana Brown Arco Celluloid with Silver Trim (henceforth "Paragon" for sake of brevity!) is a 12-side faceted pen. It's made with a layered celluloid somewhat comparable to the stacked coin celluloid of Parker in the past and Visconti today. The construction of the celluloid is of course different but more importantly Arco Celluloid is cut at a right angle to the layers. This means the layers are visible moving from one face of the pen to the other rather from finial to finial as with Parker and Visconti. OMAS has a Green and a Brown Arco celluloid; this is clearly the brown and reminds me a lot of Tiger's eye. The celluloid is smooth and warms somewhat with contact. It feels softer and more luxurious than most acrylics. This is common for a celluloid material. The pen's trim is 925 Stirling Silver or 92.5% silver. You can get the pen with a gold trim, which is more widely available from what I've noticed and heard, but I actually prefer this silver trim; it softens the warmth of the brown Arco a little whereas gold accentuates the warmth. The Paragon has a fairly straight construction only tapering slightly on the piston knob. It has mostly flat ends but they do quickly taper to a smooth point on both the cap finial and the filling knob finial. With 12 facets and 12 ridges it's a rather smooth transition from face to face; you can't really feel the facets. The bow-shaped clip is is solid (and unsprung). The raised end and the classic OMAS wheel allow the clip's good pressure to keep in place but also easy to clip onto something and easily enough to remove. It's also fun to spin the wheel. The cap's silver band has a greek Meandros around much of It but leaves space on the clip's side for "OMAS" to be written. The finial of the piston knob is otherwise unadorned but the finial of the cap has the typical Omas circle on it. The piston knob when fully tight doesn't completely align with the rest of the body. This might annoy some people but it doesn't bother me too much. The cap also has to be screwed in from one position for it to be aligned with the Arco of the body. Fortunately, with this pen at least, to align the cap you had to align one of the yellower Arco faces with the yellow stripe under the clip (but not the other). This is easy to memorise so that helps. Due to how the Arco celluloid is cut and the type of layered celluloid it is there are two beautiful sides and two less interesting sides. When looking at the pen from the side (clip pointing up or down) the pen is a much flatter and less distinct brown colour here compared to the shiny Tiger's Eye-like look to it when viewed from above (with the clip pointing up) or bellow. 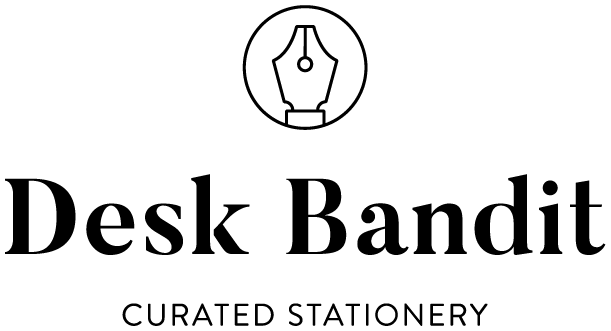 The nib is a bi-colour nib that is rhodium plated with gold as the decoration. The nib has "OMAS" inscribed on it as well as 18 K and 750 (75% gold) and "M" for its Medium nib size. The nib itself is superb. Buttery smooth without a hint of a baby's bottom. Decently wet but not a gusher and it very writes nicely with drier Montblanc inks (in the pen for this review is Montblanc Leonardo Red Chalk) and wet Sailor inks. It has a somewhat thin line for a Western Medium nib size, however (see below). The silver section is has a faceted ridge at it's end (just before the nib) and the metal section isn't as slippery as some metal sections I've used. For example, this is much better to grip than a Lamy Studio. The threads are thin and not sharp as well. The pen is definitely what I'd consider an oversized pen. It's quite large at 133mm long uncapped. The grip section is also on the wider side with it growing to 12.5mm at it's widest (from 10.5mm, however, which isn't excessively wide). It is also very heavy at 35g uncapped compared to 11g for a Lamy Safari; it's more than three times the weight of a Lamy Safari! That's very heavy. Left to right: Pelikan M805 "Ocean Swirl", Visconti Homo sapiens "Bronze Age", Montblanc 146, Lamy Safari "Dark Lilac", Pilot Vanishing Point "White Carbonesque", Nakaya Decapod Writer "Aka-tamenuri", Platinum Century #3776 "Chartres Blue", OMAS Paragon Arte Italiana "Arco Brown", Sailor Pro Gear (Wancher exclusive) "Mocha", and TWSBI Diamond 580. The pen's physical size compares similarly to a Visconti Homo Sapiens but it still slightly longer both capped and uncapped. This was a favourite pen for me. It took me quite a while to pay off the lay-by and it was definitely worth it for me in the end. It's a gorgeous pen and I love the stunning Arco celluloid. These pens aren't impossible to find second hand or as new (the silver trim may be more difficult to find, however) and they aren't particularly rare but their initial starting price was high and with the closure of OMAS there is some scarcity to them so the price has gone up. The weight was a little high for me; although I didn't find it overly uncomfortable to write with for longer periods it wasn't the most comfortable pen for me either. The size, while not unwieldy, did accentuate the weight a little. I still loved writing and especially looking at the pen. 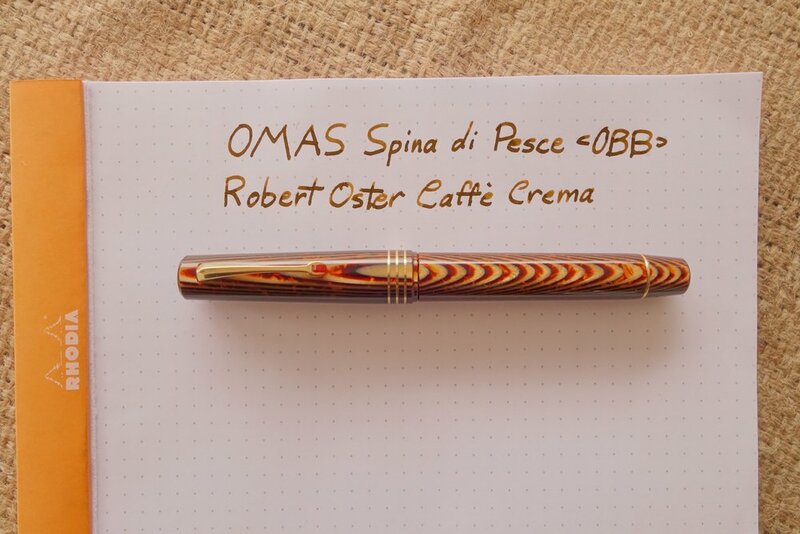 The OMAS I traded this for is an OMAS Spina di pesce fountain pen where the brown Arco celluloid is cut from a angle in-between 90° and 0° to give it a fishbone like look (the cap is still the same cut as this Paragon, however). The pen is a similar weight and size to a Lamy 2000 which is a weight and size I really like. The nib is a left-foot oblique double broad which I'm not too fond of as I don't rotate the pen naturally but it is nice and smooth; I think I'll get this turned into a Cursive Italic one day! I'm happy with the trade. Some photos below of this pen. OMAS nibs have a good reputation and the build quality and design have a similar good reputation. If you pick one of these up I doubt you'll be disappointed! For blog updated you can follow @macchiato_man on Twitter, subscribe via email, or like my Facebook page.